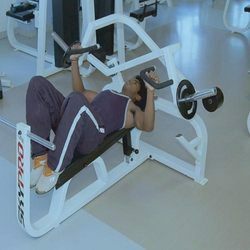 We offer Bi-angular Bench Press which is a strength product belongs to the family of gym equipments. Bi-angular Bench Press is a vertical stand which is used to hold barbells. The greatest advantage of the Flat Bench Chest Press is the fact that it brings safety to the table. Innovation is our forte and we strive to design and develop a precision engineered collection of Bench / Pedestal Press. These products are manufactured complying prevailing industrial norms and standards. Our presses has won the accolades of different customers for their sturdy construction, ease of use, durable and superior performance. Bench press with stainless steal. Dual handgrip design accommodates different sized users and varies exercise position. Dual handgrip technology creates a slight converting path a hybrid between a barbell and a dumbbell bench. 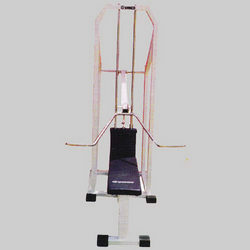 Large structural frame insures balanced lift when using heavy weight. Product Description Bench press for dental laboratory applications. Long sturdy locking handles for firm tightening of dental flasks. Threading on the locking handles for firm tightening of dental flasks. Provision for mounting on table top bench.